Any accusation against any law on an article or based on this or that case in Cambodia that the court officers in Cambodia almost no need to go to the law school, judge and prosecutor school, lawyer school and the training of justice police officer, it still can do these jobs. It is typical that their discretion seems to suffer from many pressures — politics, powerful people, affiliates and bribery. The case of Ang Maltey, former Phnom Penh Municipal Court Chief, demonstrated to the public that the Court is corrupted. Some cases related to the criminal act do not necessarily need to be addressed by the Court, and can instead be solved by the justice police or senior government official’s intervention. For instance, the recent case in which a police officer, the son of the secretary of state of the Interior Ministry, fired a few rounds to threaten another person due to minor traffic accident. Finally, the case was solved by implementing the administrative punishment to the shooter. In contrast, the monk who played a toy gun in Battambang province last week was arrested and prosecuted by hiding and using illegally. A similar case which demonstrates corruption involved is the detention of four ADHOC officers and one NEC deputy-general secretary for 14 months. They were accused of bribing the witness Khom Chandaraty (called Sreymom), who was involved in a love affair with Kem Sokha, CNRP’s President. Last week’s investigation result shows the public perception viewed the delay or the attempt to prolong the case as long as possible. However, both sides [Kem Sokha and Sreymom] of this case were free and now walk freely and continue to do politics. For the detainees of this case, they were being imprisoned because they just gave $204 to Sreymom as stated in the ADHOC general policy to support the victim who requested for help in the Sreymom case. In this case, if the Anti-Corruption Unit and the court accused and detained only the five officials as involving corruption activity; so, why Sreymom despite receiving a ‘bribe’ of $204 has not been detained? Why the law is enforced only on one side to the five human rights officials, closed to18 months of detention statute. There is no equality before the law between the giver and receiver of the bribe. For this case, it is obvious that there is so much injustice. If Sreymom, the bribe receiver, has been freed of charges, then the five officers who bribed her should have been freed on bail as well. 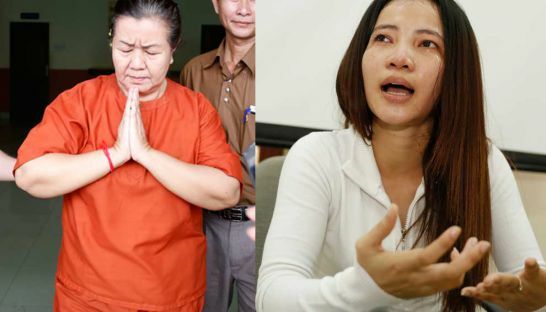 Long detention for the victims and the court’s inability offer the justice contrast to the Charter of the United Nations which Cambodia has endorsed with by the international law standard. It requires the court have to release the detainees immediately. Moreover, the ruling party has not gained the popularity in the election from detaining those officials instead it lost the voting count from the detention. In fact, this commune election, the ruling party experienced 1/3 decline of its seats for the commune council chiefs compared to the 2012 commune election. On the other hand, some activists of CPP criticized their own government for the declining vote caused by the detention of those five officials. In fact, the important purpose of the detention of the five officials, the government likely used the method—killing one chicken to intimidate 100 monkeys to silence the civil society organization officials when they protest against the government. The implement of this case showed that it is very effective in silencing the officials and they seemed not to come out and criticize the government strongly as before. The consequence of this method is the loss of the popularity of the ruling party itself since it usually expresses about their desire to serve the people for peacebuilding, instead it emotionally and physical harms anyone who does not like what the government proposes. As for the international community, the donors have not interfered deeply since they were afraid of the government accusing them of violating the sovereignty of Cambodia. In general, those officials did according to the principle of their organization. However, if any accusation happens, the organization will solve it. This means that they do not act based on their personal wills, which are outside of the framework of their duty. But it didn’t work that way, the individuals were arrested and detained. Therefore, the ruling party should consider finding the solution before deadline of the detention of those five officials, or else Sreymom, bribe taker, should be detained for 14 months as well because she is also wrong. If the government cannot do that then the detainees should free them as soon as possible. It is beneficial for the ruling party and this case will benefit the opposition party without doing anything at all with regards to justice.